Watching all of the NaturallyCurly Editors practice their self-care this month has been a fun way to see everyone's personality, and also an inspiring look at all of the different ways to care for yourself. Our Social Media Manager, Leslie Lozano, cares for herself by caring for her skin. This can mean taking the extra time in her morning or night to moisturize and exfoliate, but recently it has come to include scheduling time with an aesthetician to get a facial done by a professional. After exfoliating or caring for her skin, Leslie likes to imagine the negative thoughts and stresses of life flowing into the sink and down the drain as she washes her face. It's an opportunity to acknowledge that negativity and let it go. "Afterwards my skin feels soft, it feels magical, I feel fabulous!" says Leslie. Don't you feel soothed watching that video, and a strong urge to go get a facial now? 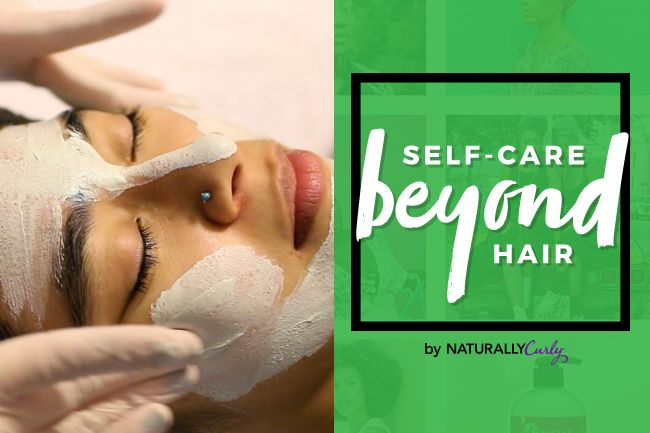 We've loved exploring Self-Care Beyond Hair on NaturallyCurly this month, and we'll continue to discuss how caring for your natural hair is a form of caring for yourself. If you'd like to see more of our self-care practices, watch below! See why thrifting is therapeutic for Devri. Watch how Gerilyn cares for herself by caring for others. And watch how I practice self-care in my nighttime routine.